A house at the beach means different things to different people, but almost everyone agrees that the most appealing and enduring vacation homes offer a relaxed attitude, a welcoming stance, and a sense of place. 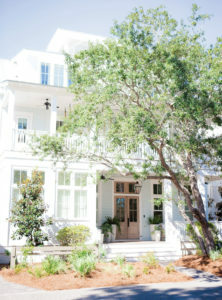 Designer Ashley Gilbreath, who works from a satellite outpost in Rosemary Beach, Florida, as well as her main office in Montgomery, approaches these homes with a unique philosophy—out with the rules and in with the joys of outfitting each residence with a playful spontaneity and a mindset of comfort. She has designed a variety of delightful second homes, including condos, family compounds, and renovated waterfront cottages, with a style that is fun and personal. 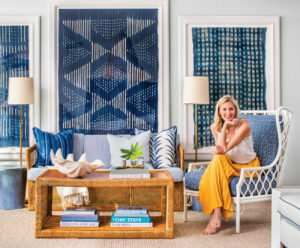 These four beach retreats along Florida’s Gulf Coast illustrate Ashley’s distinctive approach to creating gracious environments while proving that the most successful projects focus not only on beautiful design but also on how a family likes to live at the beach. 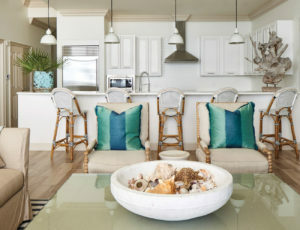 Large-scale furnishings and accessories combine with a neutral color palette to create a cohesive flow in a relatively small beach condo. In the living room, two pieces of oversized art make a big impact. 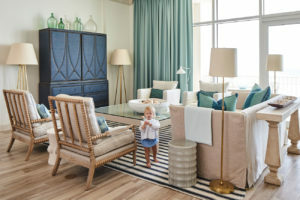 For her own place in Rosemary Beach, Ashley packed a lot of punch in only a thousand square feet to accommodate her family of five plus a dog. 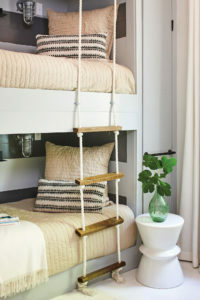 A set of bunks in the guest room makes the most of the space, while ship-style lanterns and a rope ladder add nautical touches. The updated kitchen features marble countertops with a waterfall edge and a lap-siding hood of raw cedar. 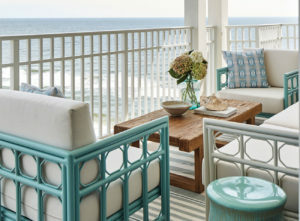 Ashley chose durable finishes and Sunbrella fabrics to accommodate the wear and tear of vacation renters. The peninsula frames a compact, efficient kitchen while providing space for seating and casual beach entertaining. Build-in bunk beds allow the two-bedroom home to accommodate more guests. 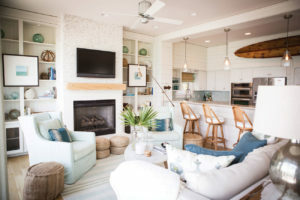 When decorating a full-time residence in the resort town of WaterColor, Florida, Ashley delivered the perfect mix of coastal flair and practicality for a young, active family. With both casual entertaining and family living in mind, the designer installed a large island with seating to anchor the open kitchen. French doors fill the dining space with natural light and open onto the rear terrace for a gracious interchange between indoors and out. To accommodate weekend visitors, which is a regular occurrence at the beach, the guest suite includes two full beds and a loft space. Nestled behind a twisting oak, this home is a fresh take on a classic Southern farmhouse with deep double porches, sturdy columns, and wide steps. 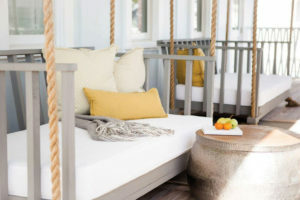 Custom-designed bed swings on the front porch provide a great spot to relax. An antique mirror and custom-designed bench anchor a sunny corner of the living room. Tall windows crowned with transoms flood the dining room with natural light, while continuous sheer draperies soften the space. 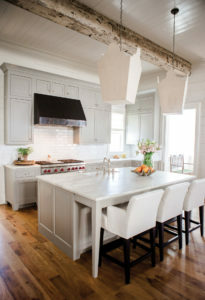 A rough-hewn, salvaged beam and a pair of contemporary pendants over the island animate the open kitchen. Tall ceilings in the guest suite allow for a sleeping loft. With a jewel of a perch overlooking the Gulf along Scenic 30A, this renovated 1960s cottage now radiates with a classic coastal vibe and a cozy timeworn aesthetic. 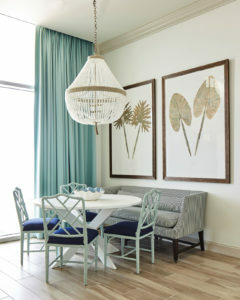 The palette includes muted tones of greens, blues, and driftwood. Bookcases filled with seaside artifacts flank a tabby wall that accommodates a fireplace and television. The dining table’s prime location makes it a central gathering spot, so Ashley chose comfortable wicker slide chairs that can also be pulled into the living room after meals. 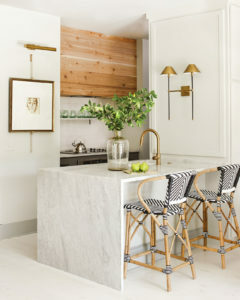 A vintage wooden surfboard enlivens the open kitchen. 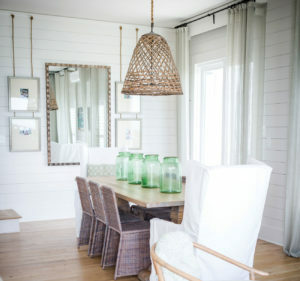 Beach family photos cleverly hung on ropes pair with a large mirror in a weathered frame to create a focal point in the dining area. 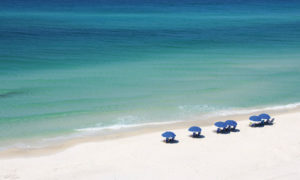 Emerald-green water, sugar-white sand, and warm days make up the recipe for the ultimate Florida vacation. While every expanse of coastline has its own character and charm, the 20-mile string of coastal communities along Scenic Highway 30A may boast the best the beach has to offer. From Inlet Beach to Seaside to Dune Allen, there’s always something new to discover. Plenty of outdoor seating and endless vistas ensure this Perdido Key penthouse hosts happy gatherings year-round. Floor-to-ceiling walls of glass flood the interiors with natural light, which prompted Ashley to choose more saturated coastal colors. A beaded-glass chandelier and a pair of large contemporary botanical prints make a statement in the dining area. Ceiling-height, aqua-blue draperies with blackout backing frame the views and soften the main living space while also providing shading when needed. A series of abstract oyster paintings set in a bar niche add to the coastal theme. 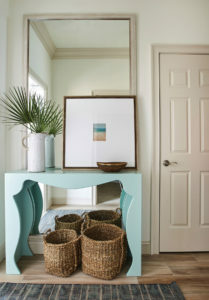 A modern, painted console placed in front of a floor-to-ceiling mirror creates an eye-catching vignette and offers welcomed storage. The living room and adjacent kitchen merge a modern, open plan with thoughtful furniture placement to capitalize on the views. Large, framed tropical botanicals and a beaded chandelier add drama to the dining area. Bedrooms at the beach are less about size and more about style.